One Hardy and his car and it ain’t Mad Max. This is interesting from the off. How do you make a film about one man driving in his car for the WHOLE film dynamic? The script for one has to be tight and the performance has to be on target, otherwise what’s the point? Fortunately for the viewer, Tom Hardy has the acting chops to take us on a journey, literally and metaphorically on that ever-so exciting run from Birmingham to London. Hardy plays Ivan Locke, who has to make a night-time car journey from Birmingham to London for reasons that will be made clear as you watch. Tightly directed by Steven Knight who had to wait several years until Tom Hardy was finally available to fit him into his schedule. It was worth the wait. Hardy delivers a performance filled with nuance and layer. It is very watchable and really shouldn’t be. On paper, one actor onscreen and several top names that only get to give good voice sounds boring, right? Vocal support comes in the guise of Olivia Colman, Ruth Wilson, Andrew Scott (brilliantly funny), Ben Daniels, Tom Holland, Bill Milner and Danny Webb. 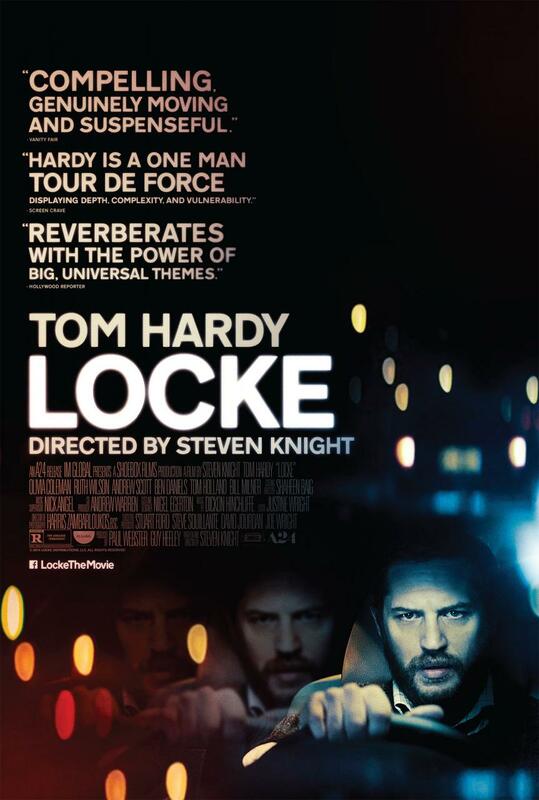 Clearly there is a reason that Locke has to make the journey otherwise it would be fricken boring and this is testament to Knight’s script that he sets the stakes high enough to keep us on board. The running time is 85 minutes and there is not a gunshot/bomb/terrorist/ kidnapping in sight, yet the tension is palpable. I watched this after a 4 day festival and my 3 companions all fell asleep, not because the film was boring, each of them stated they wanted to re-watch it. The blame clearly lays in the over doing it of the fest. It intrigued me enough to stay awake and see it through. A very different thriller that keeps you interested even though you’re on the M6 for the lion’s share of it, possibly one of the most boring motorway journeys in the world made truly engaging. Great review! It’s amazing how engrossing a film about a man talking about concrete is. Thanks, man. Interesting little film. Good review Damian. The reason why this works as well as it does is because of Hardy and how he’s able to compel us with just about every second he’s up on screen.